Our average daily consumption of water has risen steadily over recent decades; up from 80 litres per person in the 1960s to 140 litres today. With a steady increase in population expected over the coming decades, the impact of our water usage on the environment will become increasingly unsustainable. But it doesn’t have to be that way. The UK and Welsh governments have both made water efficiency a key priority. For their part, both Ofwat and Waterwise have been working actively to try to positively influence how the water sector approaches efficiency. Ofwat’s forthcoming price review (PR19), has resilience right at its core. The PR19 methodology, published last December, includes per capita consumption as a common performance commitment across all companies and expects companies to make stretching commitments to reduce consumption. When Ofwat reviews companies’ business plans as part of PR19, it will scrutinise closely the ambition each company has shown in its business plan. 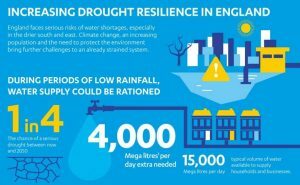 Waterwise has set out a water efficiency strategy for the UK, developed in consultation with water companies and supported by a water efficiency strategy steering group. Intended to be a blueprint to deliver a vision of a UK in which water is used more wisely and efficiently, the strategy lays out a series of actions for water companies, government, water retailers, regulators, manufacturers, NGOs and others. Waterwise is also working closely with wholesale company customer executives, and with water retailers, to help mainstream water efficiency across the sector. It’s clear to both Ofwat and Waterwise that the level of consumption in the long-term could be much lower than it is now. Already, some water companies – such as Southern Water and Anglian Water – say that they aspire to eventually reduce consumption to approximately 100 litres per day; although we note some of these commitments have yet to feature in Water Resource Management Plans. And research commissioned by Ofwat suggests that anything between 49 litres and 105 litres per day might be possible by 2065. Reducing the amount of water we use in the years ahead will require a step change in leadership, ambition and innovation on the part of the whole water sector. It will need to be underpinned in individual wholesale water companies by a clear roadmap for achieving the long-term targets set, with concrete actions, clearly costed, stretching from the next five years through to the next 25 years and beyond. Water companies have been offered the tools and incentives to bring about a step change in water efficiency. But delivering this change will require going well beyond simply setting targets and adopting new technologies; water efficiency needs to become an ambition rooted firmly in the culture of every water company and that ambition needs to flow right through the company from the boardroom, to the customer service agent, to the engineer on the ground. For example, we were impressed that Northumbrian Water’s entire executive team carried out the Cape Town challenge during 2018’s Water Saving Week – using a maximum of 50 litres of water each a day. In addition to improving their own performance, wholesale water companies must also become must better at working together, pooling expertise and sharing the best of innovative technologies and ideas across the sector. The challenge includes water retailers as well as wholesalers. 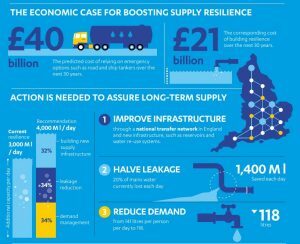 Since the opening up of the new retail water market in 2017, water retailers now have an important role to play in helping their business customers – many of whom are large consumers of water – to better manage their usage, and in the overall resilience of this essential public service. Finally, we must not forget the crucial role of the customer. Everyone could take small steps at home and in the workplace to use water more efficiently. Water companies are ideally placed to support their customers to manage their water usage. We are all becoming ever more aware of our environmental footprint and local water companies can help customers to make a positive difference. The water sector has taken some big and important steps to improve water efficiency. However, given the environmental and demographic challenges ahead, we need to see this mainstreamed right across water companies. We’re sure the water sector can rise to the challenge. What are Water resource management plans? It is a statutory requirement for water companies to produce and publish a Water Resources Management Plan (WRMP) every five years. Companies have published their draft WRMPs which have been consulted on. They are due to publish their final plans in the autumn this year. In April, the National Infrastructure Commission published a document which urge the government to “immediately” start adopting a twin-track approach to boost supplies while cutting demand. The report – Preparing for a Drier Future – recommended that Ofwat launch a competition alongside PR19, to ensure the provision of at least 1,300 million litres per day through a national network that would transfer water from areas of surplus to those that need it. It also said the provision of new infrastructure, such as reservoirs and desalination plants in a wider range of places, is needed to reduce costs. And the commission urged the Department for Environment, Food and Rural Affairs to set an objective for the water industry to halve leakage by 2050, with Ofwat agreeing five-year commitments for each company.